Above: the video and song from Colony 5. 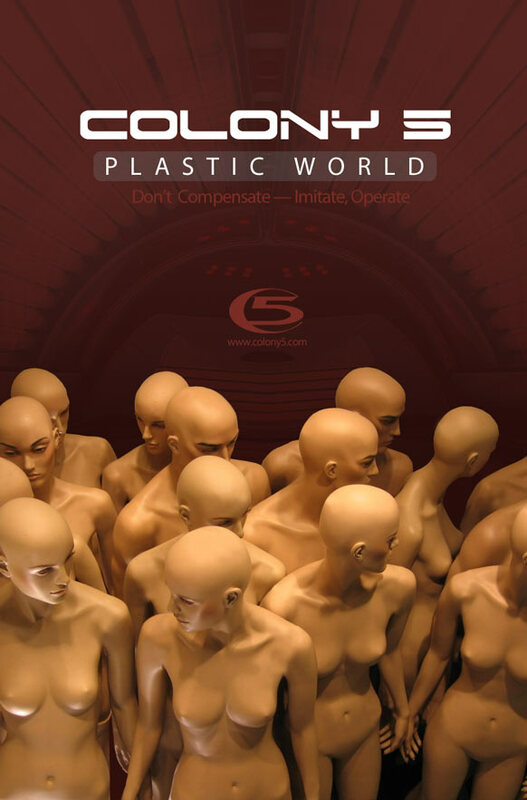 I took this “plastic world” idea and ran with it, using mannequin stock photos to create a huddled, futuristic world of clones. I did extensive photomanipulation to get themannequin elements out of it, such as bolts, lines and other extraneous elements. I made it look like actual humans, albeit plastic and fake. The solution was very simple but powerful and obvious. I then took a futuristic background and mirrored it, while overlaying a red color to provide some sharp contrast and make the image more powerful. This was done as sort of a “tribute” and was never actually used. This was done quite a while back (03/2006) so I was impressed at the results and how clean yet informative the look was.